← The Liberals Adopt Primaries for Selecting Next Leader? Alex Salmond, the current First Minister of Scotland, and his Scottish National Party won a parliamentary majority earlier this year – a significant first for the new Scottish Parliament and its mixed member proportional electoral system. The Scottish National Party seeks the independence of Scotland and therefore the dissolution of the United Kingdom of Great Britain that the Act of Union established in 1707; First Minister Alex Salmond has since pledged to hold a referendum on Scotland’s independence in the second half of the current 4th Scottish Parliament, probably in 2014. The Scottish National Party’s pledge has caused some consternation in England itself, but thus far Prime Minister Cameron has affirmed that the Scottish Parliament possesses the authority to hold such a referendum and that the Westminster Parliament and his government will not interfere. The politico-constitutional consternation in the United Kingdom carries implications that may pertain to Canada and the question of Quebec’s secession from our federal union. I will briefly summarize the history of The Crown of Scotland and the creation of the United Kingdom as well as the nature of the new Scottish Parliament. Elizabeth I died without royal issue in 1603, and thus the glorious House of Tudor died with her. The threat of invasion from the French or Spanish and a protracted war of English succession compelled Elizabeth I’s courtiers to arrange that King James VI of Scotland also assume the Crown of England upon Elizabeth’s demise. James shared a distant blood relation to the House of Tudor (his great-grandfather James IV married Henry VIII’s sister Margaret), and he was a Protestant. James VI of Scotland also became James I of England and became the first monarch to hold the personal unions of the crowns of Scotland and England, which lasted from James’s accession to the throne of England in 1603 to the Act of Union, 1707. This personal union of the two crowns meant that England and Scotland maintained their status as separate kingdoms with separate parliaments and separate state churches, but shared one monarch. The 16 Commonwealth realms today constitute a personal union. James I sought unsuccessfully to convert this personal union into a full political union. English historian David Starkey explains the negotiations that led to the creation of the United Kingdom in the Act of Union, 1707. In 1701, the Westminster Parliament passed the Act of Settlement in order to ensure the Protestant Hanoverian succession to the crown of English after Anne’s demise – but the English never consulted the Scots. In response, the Scottish Parliament passed the Act of Security in 1703, which stipulated that the crown of Scotland would also passed onto a Protestant, but not the same Protestant who would wear the crown of England. The Westminster Parliament passed the Aliens Act and banned the major Scottish export trade to England in order to constrain Scotland’s finances and force the Scots to negotiate. Queen Anne succeeded where James failed. The Act of Union, 1707 secured the personal union of the crowns of England and Scotland and prevented their bifurcation and created the political union of the United Kingdom of Great Britain. In order to achieve full political union, both the Westminster Parliament and the Scottish Parliament had to agree on the Act of Union. But the Scottish Parliament also had to vote not merely for its dissolution, but for its total demise; under the United Kingdom, the Westminster Parliament would govern for all of Great Britain. The Scots received full access to all the prosperous English colonies – which thereafter became part of the British Empire. While the Scots relinquished their parliament and sovereignty, they never surrendered their distinct national identity. 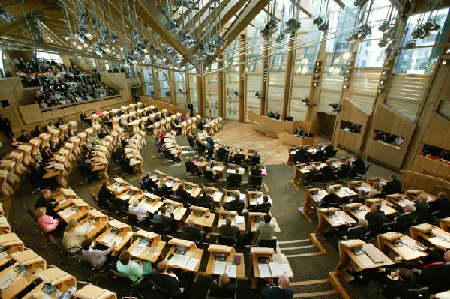 The Scottish Parliament adopted the semi-circular seating arrangment of the New Zealand and Australian Houses. This stubborn Scottish nationalism culminated in the reestablishment of the Scottish Parliament in the form of a devolved assembly, as the Blair government set out in the Scotland Act, 1998. The new Scottish Parliament deviates dramatically from the traditional Westminster model, as this pamphlet and the Scotland Act show. It consists of 129 “Ministers of the Scottish Parliament”, or MSPs, and it operates on a mixed-member proportional system. 73 of the MSPs represent the single-member constituencies; the remaining 56 “Regional MSPs” are elected on the basis of party affiliation in 8 Scottish Parliament Regions, each of which contains 7 seats. “In each region, parties are allocated seats depending on the number of votes they receive in this regional ballot, and taking into account the number of constituency seats they win in the region”, which ensures the overall proportional result. The New Zealand House of Representatives operates on this system as well. Initially, the Scottish Parliament had also deviated from the Westminster model by pioneering true fixed elections every four years; ironically, the Westminster Parliament has itself now adopted this radical method with the passage of the Fixed-Term Parliaments Act earlier this year. The Scottish Parliament pioneered the elimination of crown prerogative on dissolution: the Scottish Parliament dissolves and summons itself automatically every four years so that the elections occur on the first Thursday in May, and the new parliament convenes 7 days later (section 2 of the Scotland Act). The most recent occurred in May 2011. The words “prorogue” and “prorogation” appear nowhere in the Scotland Act, so I can only presume that the Scottish Parliament not only eliminated the crown prorogation on the summoning and dissolving of Parliament but took the even more radical step of eliminating the entire concept of prorogation altogether! However, the Queen still formally opens the Scottish Parliament, though as this footage from July 1st, 2011 of the convening of the 4th Scottish Parliament shows, this ceremony does not appear to share the same significance or constitutional status as the Queen’s Speech. While the Crown of Scotland sits before Her Majesty, she neither wears it, nor the full state regalia that she dons for the State Opening of the Westminster Parliament. And here’s another question: how can the Queen even enter this unicameral parliament? This confidence chamber is the equivalent of the Houses of Commons and Houses of Representatives elsewhere in the Commonwealth realms, and the Queen and her representatives never set foot in them. The last monarch who stepped foot in the House of Commons, Charles I, thus precipitated the English Civil War and ultimately lost his own head. (1) The First Minister may, with the approval of Her Majesty, appoint Ministers from among the members of the Parliament. (2) The First Minister shall not seek Her Majesty’s approval for any appointment under this section without the agreement of the Parliament. The Parliament confirms the First Minister’s choice of ministers for portfolio like the US Senate must confirm the President’s choice of cabinet. Under the normal Westminster model, the Prime Minister nominates and Her Majesty-in-Council or the Governor-in-Council formally appoints a minister – but the Queen or Governor General does not possess a reserve power to refuse such appointment. This Scottish system revolutionizes and fundamentally alters this process: the First Minister formally “appoints”, the Parliament “agrees” (or confirms the appointment), and the Queen “approves”! Overall, the Scottish Parliament is a bizarre hybrid of the congressional and Westminster parliamentary models: the Scotland Act codifies (and therefore limits) crown prerogative, and not only codifies a basic outline of the confidence convention but also vests the power to approve appointments in the parliament. 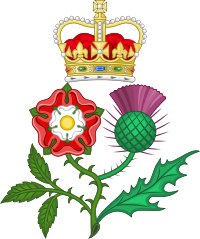 James I: The English rose and Scottish thristle represent the separate kingdoms of England and Scotland that fall under the same crown in a personal union. Finally, after having explained the history of the Crown of Scotland and the powers and functions of the Scottish Parliament, I come to the Scottish National Party’s proposal for Scottish independence. So if “the Constitution” falls under one of the policy fields reserved to the Westminster Parliament, then how can the Scottish government undertake a referendum on Scottish independence? Like the Parizeau government of Quebec in 1995, the Salmond government has portrayed the referendum on an independent Scotland as a mandate to negotiate. The Salmond government published its conception of an independent Scotland in Scotland’s Future: A Draft Referendum Bill Consultation Paper. From what I’ve read so far, Alex Salmond seems like a genuine monarchist, and for practical political reasons, the Scottish National Party will put forward a conception of an independent Scotland that it believes can win the support of a majority of the Scottish people. In addition, the Royal Family summer in Balmoral in Scotland – and Queen Elizabeth II herself, not the Crown Estate, owns Balmoral. 1.19. Her Majesty The Queen would remain as Head of State. The current parliamentary and political Union of Great Britain and Northern Ireland would become a monarchical and social Union – united kingdoms rather than a United Kingdom – maintaining a relationship forged in 1603 by the Union of the Crowns. In all reality, the dissolution of the United Kingdom would not “maintain” a relationship forged in 1603: it would restore this personal union of the crowns. I’ll watch Scottish politics with great interest in the years to come and observe how this referendum campaign unfolds. 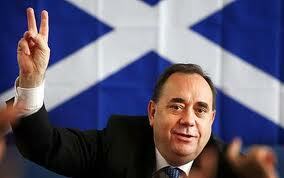 This entry was posted in Appointment of PM, Constructive Non-Confidence, Dissolution, Fixed-Date Elections, The Personal Union and tagged Act of Union 1707, Alex Salmond, Fixed-Term Parliaments Act, James I, mixed-member proportional (MMP), personal union, Scotland Act 1998, Scottish National Party. Bookmark the permalink. Excellent summary of the history of the union and the current Scottish Parliament as well as prospectives for the future. I would quibble with only one thing. You say, “But the Scottish Parliament also had to vote not merely for its dissolution, but for its total demise; under the United Kingdom, the Westminster Parliament would govern for all of Great Britain.” Actually, the Act of Union created a new Parliament, the Parliament of the United Kingdom of Great Britain, and dissolved both the Parliament of Scotland and the Parliament of England. However, because the new Parliament was located at Westminster, the damn English considered that they had merely allowed a few Scottish MPs and Lords to join with them in their English Parliament. And because of the English concept of Parliamentary supremacy, the Parliament of the United Kingdom was free to legislate without regard for the Treaty of Union and did so on occasion. Very well. In legal terms, you are correct, but in practical terms, England inevitably became the senior partner when James VI of Scotland re-located his court to London. In addition, the traditions of the Westminster parliament remained intact and survived the transition from the nominal English to nominal the British parliament. These traditions ultimately concern me most. According to the Scotland Act, 1998, the Westminster Parliament still legislates on constitutional matters. Separation is clearly a constitutional matter. You might want to check more recent utterances of various UK ministers re: Scottish independence. They’re sounding more like they will interfere, including introducing a UK version of the Clarity Act. Good! The Westminster Parliament should exercise its legitimate authority on constitutional matters.